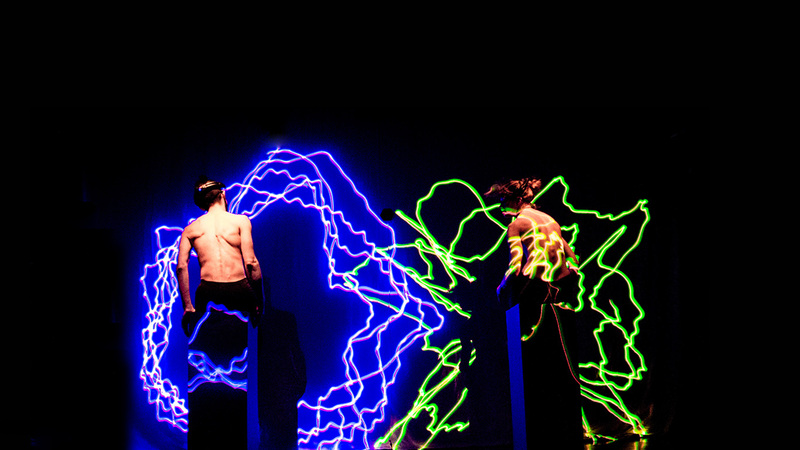 I work in the field of performance art, integrating electronics and systems thinking into scenographies for stages. My visual scenarios deliberately negotiate the constructive tension between the carefully constructed and generative processes, between risk and responsibility, and between autonomous performance and human intervention. Making visual compositions and being analytical about structures and systems starts with observing patterns and to take a birds-eye view on stuff to see how things, ideas, and people act together. I started my career as an architect the political and social climate of Berlin after the fall of the wall and moved to the Netherlands to engage with dynamic approaches to space and movement. I studied choreography and Mediatechnology. 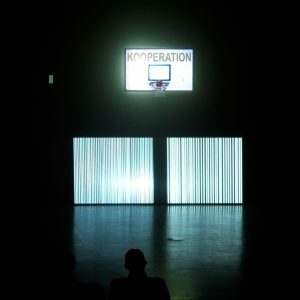 My work engages systems thinking, cross-disciplinary perspectives, and experimentation – integrating computational processes and live-performance into stage scenarios. 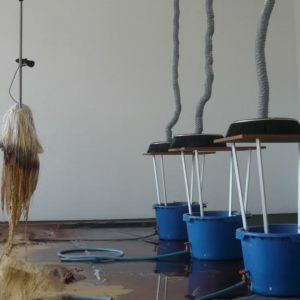 Currently I teach at the Eindhoven University of Technology and at the ArtScience Interfaculty at the KABK in the Hague. I am based in Amsterdam. Collaboration and transdisciplinarity are core aspects driving my work, and I frequently join forces with other artists, designers, and engineers. I recently co-founded the performance collective NOW – live performance and living ecologies, consisting of Ivo Bol, Roos van Berkel and myself. We are currently experimenting with conscious and unconscious blinking as indicators of states of mind for our new performance BLINK…and sync. We used EEG data for performances and live compositions of laser, movement, and sound in our earlier performance (un)focussed. I am a believer in communal structures and therefore became a member of the BAU Committee, together with Eva Villanueva, Julia Willms, Keren Levi, Gulio D’Anna, Marjolein Vogels, Michael Jahoda, Nicole Beutler, Orion Maxted, Riccardo Guratti, Sarah van Lamsweerde, Susanne Marx. BAU is an organization for the independent performance scene in Amsterdam. Berlin is my hometown where I maintain a long-term work relationship with German choreographer and dance pedagogue Nadja Raszewski (Tanz Tangente Berlin), who is in demand internationally for her experience in developing performances with large groups of non-professionals from diverse social backgrounds. I believe that these community-orientated projects call for both a scenographic vision and technological infrastructure that meet the participants’ risk-taking at their level of openness and performative flexibility. These projects are communal contexts wherein I work “live” and with contingent technology because I want to put democratic values into practice. In 2008 I co-founded the artist collective In Serial consisting of Linda Dement, Petra Gemeinböck, PRINZGAU/podgorschek and myself. In Serial explores escalating interactions between non-human protagonists, foregrounding materiality and agency, and using materials and digital media that are apparently conflictive. Together, we developed the performative installation On Track. 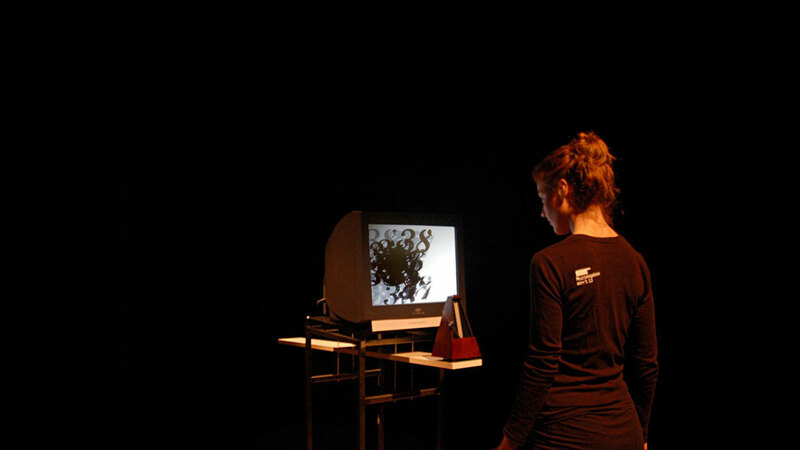 I was a member of the European Mobile Lab for Interactive Artists (2008-09), a project tailored around the process of collaboratively creating interactive installation artworks, and participated in several art residence programs. To me making, learning, and teaching are reciprocal processes that flourish best in collaborative, and project-based environments. I have taught in the Netherlands, Canada and my native Germany, and have developed academic courses at both the graduate and undergraduate level. Formats include workshops, seminars, interfaculty courses, team-teaching and support for individual students and makers. For the study year 2018/19, I am a guest lecturer at the ArtScience Interfaculty, an interdisciplinary bachelor’s and master’s programme. I coach students and device courses on systems thinking / feedback systems and rule-based performance systems. The focus of the department is on the design of intelligent systems, products and services. As a practitioner from the field, I am joining the theme led by Professor Harm van Essen on “social interactions with shared systems” that focuses on interaction design for improved user experience of smart connected systems that are shared by multiple users. In June 2018, I team-taught with Annet Dekker the module: “Code Literacy – understanding the building blocks of computation”. The one-year certificate course conveys dance as an art form within the diverse practical fields of dance pedagogy. I was involved in the selection and acceptance of students, and final assessments. Within the directorial team, my responsibility was to develop practice-orientated teaching modules that relate dance to spatial-and media practices. Developing graduate seminar courses within the study area media and theatre. Students are challenged to experiment with the performative use of (live) media on the theatre stage, and to understand its dramaturgic and scenographic impact. Conception and co-direction with Carolien Hermans of the interdisciplinary undergraduate course “Art as Research”. Available to students from all faculties, this course serves as a platform for exchange and reflection on both discipline-related, and individual artistic practice. Team teaching the seminar “Interactive Installation”. This course is a practical hands-on exploration of physical computing and interactive electronics. 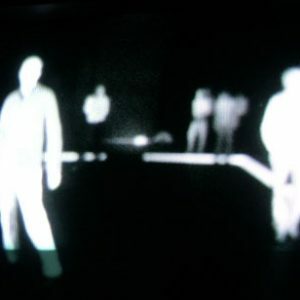 Students learn how to interface objects and installations with the viewer’s body and motion data. Team teaching in the undergraduate architectural design studio of Professor Philip Beesely. Development of design skills and theoretical knowledge. Planning of a hotel with an adjacent theatre in downtown Toronto. Emphasis is on materiality and technology in architectural design. In 2017/18, I followed a training trajectory for Software Engineering at the level of higher professional education at the Amsterdam University of Applied Science in the Netherlands. I gained fresh skill-sets in (Java) Programming and insights into machine learning technologies. For Gulliver XL, a dance performance with children from five Amsterdam schools, I collaborated with choreographer Susanne Marx to create the set-design. Gulliver XL, a child’s revolution is made by children from five Amsterdam primary schools and choreographer Susanne Marx. Together, they dance, tell and fantasize how their own neighborhood might look like in an ideal world. 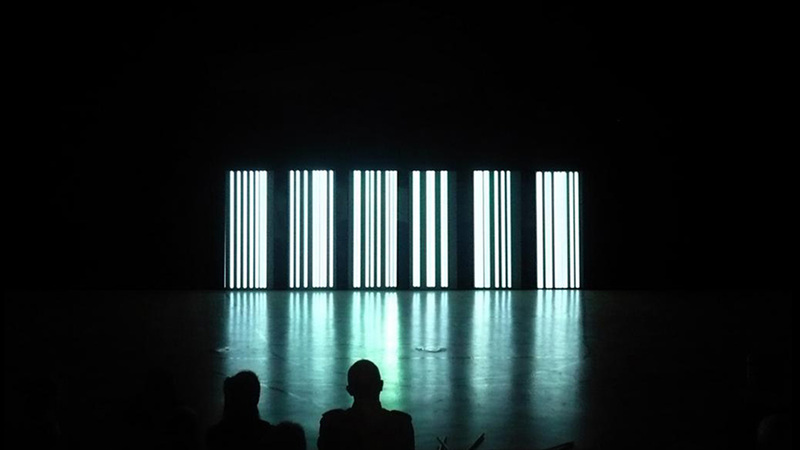 “NOW” (Ivo Bol, Marion Tränkle, Roos van Berkel) present the EEG performance “BLINK …and sync” at the forth edition of the dance and performance event Come Together in Amsterdam. BLINK..and sync is a performance using eye blinking as a performative tool. It is a part of our research into rhythms and patterns of our body and brain, and conscious and unconscious blinking as indicators of states of mind and different moods. 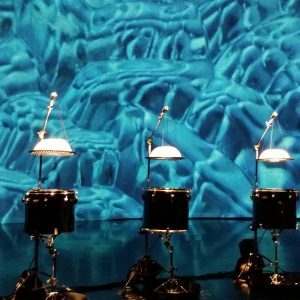 We will perform an experimental score for three people that generates blink instructions with different rhythms and chance variations. 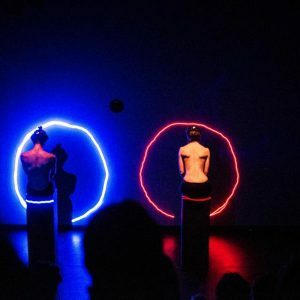 The blinks are captured with EEG and translated into a musical piece for light and sound, using the body as the intermediate between two different systems: the score and the performance environment. COME TOGETHER is a manifesto and a celebration of the many contemporary makers in Amsterdam and a call to come together and work together. During the three festival days, performance makers share insights, develop thought, meet colleagues and present their ideas to the public. See the entire program of the evening and performance times here. 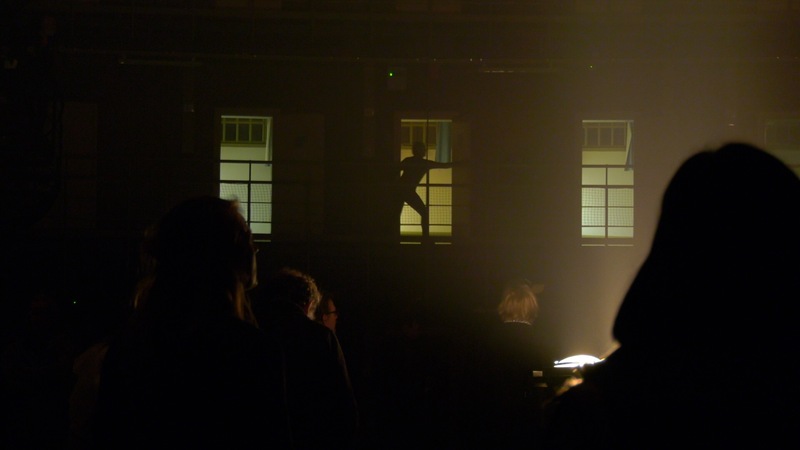 Ivo Bol and I made a performance with sound, light and movement in a special location: The cupola and former prison in the city center of Haarlem. The project is part of the art manifestation “Architectural Healing”, organized by Cityscape Foundation. SEE ME NOW ? is a live performance where the audience can experience the architecture and history of the building. With light and sound Bol and Tränkle open up the space and give voice to the personal stories related to this place. The cupola is based on the idea of ​​the Panopticum, conceived in the 18th century by Jeremy Bentham, as an architecture for perfect control. “A cruel, ingenious cage” according to the philosopher Foucault. Tränkle and Bol relate to this monumental architecture with a composition specially made with and for the building. The relation between the domes centrally organized surveillance functionality and the surrounding 224 cells distributed over 4 floors are revisited and reinterpreted by use of sound, light and movement. Rhythms, synchronous movement, relations and black-outs: continuously changing and emergent patterns created by people and their history with the building. Everyone is free to rediscover the space, there is no audience seating. By moving through the cupola, spatial and emotional experiences changes and transform the dome by our own ears and eyes. The project has been made possible with the support of The Performing Arts Fund NL and creative industries fund nl. The Performance collective “NOW” (Ivo Bol, Marion Tränkle, Roos van Berkel) presents new work, the EEG performance “BLINK …and sync” at Electronic Extravaganza Festival 2018 .
three people that generates blink instructions with different rhythms and chance variations. 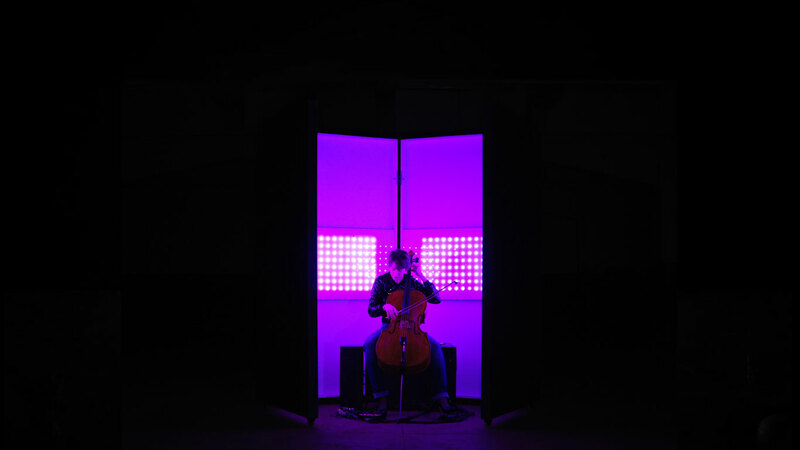 The blinks are captured with EEG sensors and translated live into a musical piece for light and sound. 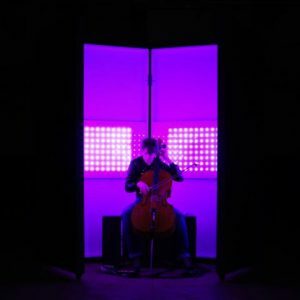 Blink …and sync is part of Electronic Extravaganza – a cutting edge festival for border crossing electronic music exploring genres such as dance, ambient, pop, noise, DIY, installation art and contemporary composed music. See the entire program of the evening here. At this year’s WE LIVE HERE Summer Academy in Amsterdam Orion Maxted and I will lead the lab , What-If-Then were we research how technology and the combination of simple rules can build complex participatory performance strategies. If you are interested to participate apply before 24 June 2018. 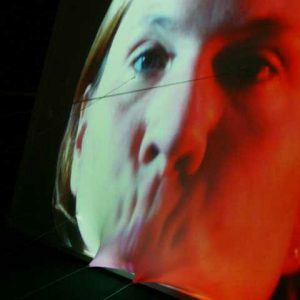 What-If-Then is devised by theatre maker Orion Maxted and media artist Marion Tränkle. 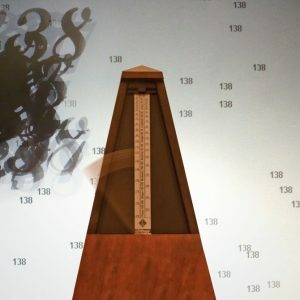 What-If-Then brings together practitioners from the performing arts, complexity science, and computer programming to work together based on the most elemental rule of computing: If-Then. In both natural and human-made systems we observe that, when several If-Then rules are combined, it can result in emergence. A famous example is the murmuration of starlings whose complex swarming patterns are thought to derive from the combination of three simple rules. We want to explore the combining of rules for building participatory performance strategies and explore the conditions under which simplicity tips into emergence. The lab take place from 9 – 13 July 2018 in Amsterdam and is hosted by BAU Platform for Dance and Performance and Nicole Beutler. See here for a detailed workshop description and information of how to apply. How to bridge science and sensitivity, physical reality and the poetry of electronic media? How to create a situation where all elements on stage relate to each other, and where material is generated such that it owns its own ‘non-intentional’ logic? 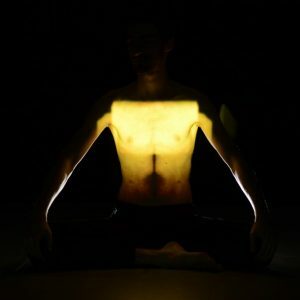 How to control light via algorithms and sensors and how to let it develop its own “organic” and evolving patterns and rhythms? Research into a systemic approach to light. Supported by the Amsterdam Funds for the Arts. Read the detailed research project description. 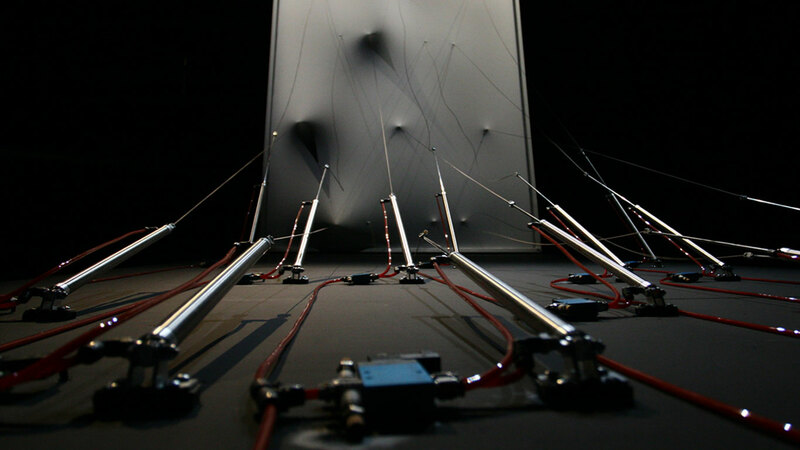 Art&design research project that explores movement actuated performance systems. Collaboration with Roos van Berkel and Serge Offermans, developing a wireless sensing and lighting control platform. In performance, this tools allows to capture movement and generate light behaviors based on sensor data. I completed a practice-based PhD at the School of Arts, Brunel University (2006-2012), in which I examined linkages between material, performative and technological processes that “act” within works of media art. See my thesis description: “Material Agency and Performative Dynamics in the Practices of Media Art”. requests. I am purposefully bad at using social media, e-mail is the best way to connect. If you want to be kept in the loop, please subscribe to my newsletter. I am sending updates a couple of times per year.